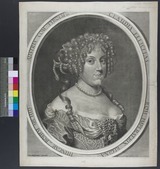 Claudia Felicitas Rom. Imperatrix Regina Hungar et Bohem. Archid. Austriæ Com. Tyroly etc / J. Hoffmann Excudit ; Philipp Kilian sculp.